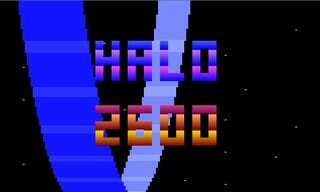 Sort of a cross between Adventure and Berzerk is "Halo 2600" by Ed Fries, a clever little timewaster that riffs on the tropes of Atari 2600 game design, especially the snicker-inducing bleep-bloop Halo Theme in the intro. Controls are arrows to move and space to shoot - but you need to pick up the gun, which is in the first screen above your starting point. You'll also snag items like shields and a key. You don't have up or down shooting, just left or right. But one hit does the trick on all foes - especially the hilarious three-elite fireteam that moves and dies as one sprite, just like the old days.